The new David Hockney exhibition of landscape paintings at the Royal Academy of Arts is like a breath of fresh Yorkshire air. 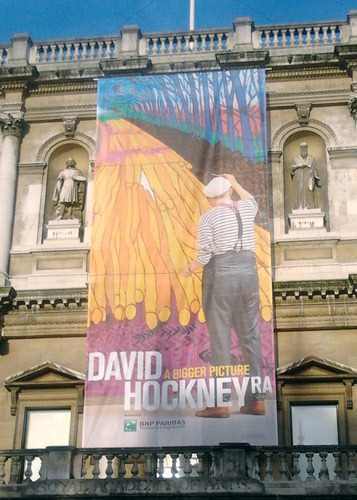 David Hockney RA - The Bigger Picture is one of the most impressive exhibitions I've ever seen at the RA. It's also one of the most accessible and least intimidating exhibitions I've seen in a long time. I think it's going to be very popular. Hockney has filled the main galleries at the RA with some 150 images. There are sketches in sketchbooks, larger drawings on Arches watercolour paper, a large set of watercolour paintings, oil paintings of every size and very large (and some very, very large) framed colour prints of digital sketches from his iPad. Plus iPads displaying sketches and a film from a novel grid of nine digital cameras displayed on eighteen LED screens. What's most impressive is that this is NOT a retrospective - despite the fact the artist is now in his seventies. Examples of his earlier landscapes are referenced in Gallery 2, however the remainder of the gallery comprises works completed in the last few years. This exhibition is about his current work. Almost all the art is paintings of the landscapes he's found in the East Yorkshire Wolds west of Bridlington where he now lives 'on location". The exhibition demonstrates a prodigious output for an artist of any age. For an artist in his seventies it's quite remarkable. This review is going to be an overview - an account of my experience of the exhibition today. Since I've got pages of notes(! ), I propose to continue and review specific aspects of the exhibition on The Art of the Landscape - my landscape art blog (see end for more details). That'll also give me time to absorb what I've seen and to reflect on it further. The hang and the size of the paintings mean that you have a very distinct feeling of being in the landscape - at times you are enveloped by trees. That's a feeling which actually grows as the crowds thin out and you can see more of the trees. If you're somebody who likes trees and the country you'll find the exhibition has a "feel good" factor. The location of the larger paintings at the end of the "long views" through the galleries also helps with the consistency of the feeling of being located in the landscape. I heard one woman say what a tonic the exhibition was for a grey day in winter - and I have to agree. It somehow manages to speak of the vitality of the painter and to be peaceful at the same time. Refreshing in every sense of the word. The colours are amazing. Hockney looks for colour. He exaggerates colour. However what we see is an amplification of the seasons since he remains true to the time of year he is painting. The "installation" in the largest Gallery (Gallery 9) is stunning both in terms of its size and scope. "The Arrival of Spring in Woldgate, East Yorkshire in 2011" (twenty eleven) records the transition from winter through to late spring on one small road in 51 prints and one large painting. The framed prints which originate from drawings made on an iPad, represent Hockney's mastery of this image-making tool. I knew we were going to see prints of iPad sketches but had no idea it was going to be so many or that they would be in a series format and have such an impact. Each of the sketches is dated and located on the road. You can see one example above from January. My immediate reaction was to start planning to do a lot more sketching using my iPad! What's particularly interesting is the mark-making and the optical plays in terms of the colours used. This is digital painting by drawing - another reason why I find this artist particularly interesting. 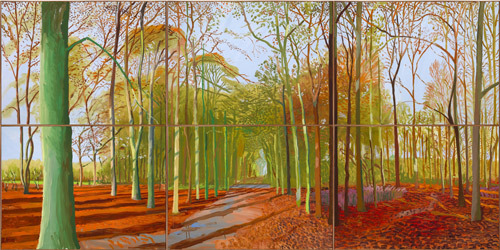 Hockney also seems to like picking a spot or a motif and then painting it again and again. In the exhibition he has complete rooms dedicated to that one motif, whether it be the hawthorne blossom or the logs or the totem tree. The gallery housing the films he's been developing of late is especially interesting. The films are taken using nine small digital cameras fixed to a grid with Hockney operating controls which dictate what they each camera looks at. He calls it drawing - and I'm inclined to agree. In the gallery given over to film, you can see two scenes of the same spot in different seasons or different times of day juxtaposed. As the curator commented they've been very lucky to have had two really bad winters for snow in succession! 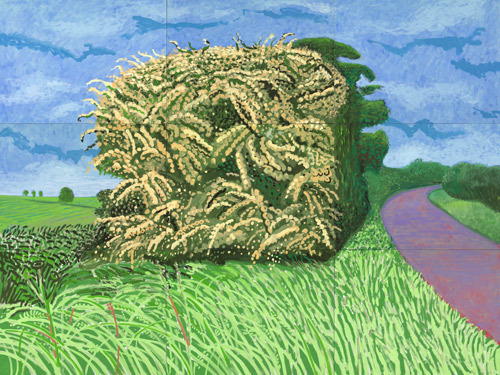 However coming after all the paintings, it means that when you look at the various scenes it's as if you're looking at the Yorkshire countryside with Hockney's eyes. As he points out cameras are unable to reproduce the optical scope and capacity of the ordinary human eye - but a multiple point perspective - a theme which has explored in the past - allows you to see more in a more realistic way. In summary, this is an exhibition which demonstrates diversity in the handling of media, progression in terms of developing themes and series and colour which stimulates the brain. This is not an exhibition for people who don't want to look. It's an exhibition which really works your eyes. It's also an exhibition for people who enjoy observing and having their optical faculties stretched. My current thinking is that you could revisit it several times and see new things each time. It certainly comes highly recommended by me. One final thought about the exhibition - which closes the circle. In 1960, David Hockney visited an exhibition by Picasso at the Tate Gallery and revisited it many times. Picasso became a great influence on his art and his career. I left the exhibition wondering which artist might have an exhibition in 50 years time - having visited and been stimulated by an exhibition by David Hockney in 2012. Notions of the "bigger picture"
My only sadness is that I won't be able to show you the images I'd like to highlight as images released for use in reviews are very limited. I'm still very puzzled as to why three are Californian landscapes when this is an exhibition about Yorkshire landscapes! My Yorkshire by: Marco Livingstone - This was a limited print run of 5,000 copies and it's sold out. The publisher still has copies. If you see a copy you might want to buy one as an investment - copies are now changing hands at prices well in excess of the original price. I shall be hugging my copy with a big smile on my face! Thankyou for this great post...I have my ticket booked and now am even more excited...love the man and his art! I have always loved David Hockney's work and this show must be truly amazing. Wish I could go to see it in person! Thanks for this great post. I think one of the things I love most about his work is that it is so approachable, very contemporary but not at all intimidating. I am very much looking forward to this exhibition. Thanks for sharing your thoughts and impressions. Thank you for this post and the review. I still wish I could go. 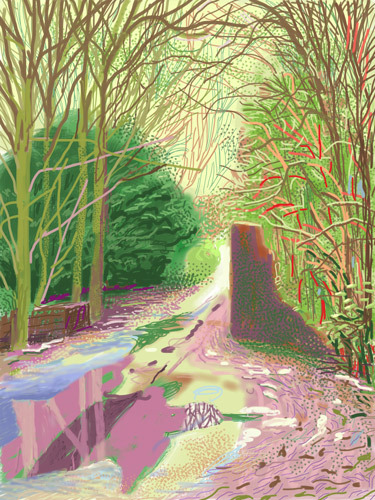 I have loved the art of Hockney for many years. It is interesting to see who it changes or better how his paintings of the English landscape are influenced by his Californian experience. I have been online to book a ticket for this but the current allocation have all gone so it'e wait for the next or go and queue. When you went did you notice how long the queues were? The queues weren't that bad but it was a Friends of the RA preview day - so no members of the public. Thanks for this review, I'm not a particular Hockney fan but when I read in another review a quote from a non-artist who said "this exhibition has made me want to paint", I thought I have to go and see it. Also just read Snook's review which starts: "It is 50 years since David Hockney graduated from the Royal College of Art wearing a gold lamé jacket." Well you know what Snook thinks already don't you? Cheap bit of ego-driven journalism. Another reason to go to the exhibition as well! What are the priorities for an aspiring artist? 22nd January - Who's made a mark this week? 15th January 2012 - Who's made a mark this week? 85% of you love "Color and Light"